A good club would concern itself with the overall well-being of the member - would care for the social, physical and emotional well-being of each member. We the club see ourselves as a part of the larger community. We try to instil a sense of self-worth in members and help develop their confidence in their own playing abilities. A good club would have an easy-going, friendly atmosphere between all. A good club would also have a competent, dedicated and enthusiastic committee with a high morale, all working towards the goal of helping the members entrusted to them. As a club we aim to have an excellent relationship with all parents and be welcoming of them at all times. Stradbally G.A.A. Club aspires to being such a club. Stradbally G.A.A shall promote and control the development of our national games- Hurling, Gaelic Football, Handball & Rounders and any other such games, as may be sanctioned and approved by the Annual Congress. It has as its main aims the player development, team formation and cultural & physical development of its player’s. The club shall also fully support the promotion and development of Camogie and Ladies Gaelic Football. It is important to put on record the appreciation of Stradbally G.A.A to the vast majority of our player’s whose courtesy, good behaviour and respect is a daily reminder of the goodness of young people.  To create a caring, friendly, supportive and safe environment.  To foster respect for and courtesy for all.  To put in place a Code of Behaviour that is just, effective, positive and in accordance with natural justice.  To ensure good order and to create an atmosphere conducive to learning to play our games.  To establish the standards of behaviour to be observed by each player attending the club and its environs.  To establish the measures to be taken when a member fails or refuses to observe such standards. The committee, coaches and mentors of Stradbally G.A.A wish to work with players to encourage, inspire and motivate them. At all times we seek to work with the support and co-operation of our members’ parents/guardians.  To be punctual for games & trainings.  To have appropriate playing equipment as per specified guidelines.  To make every effort to co-operate with the learning process in every training.  To attempt to the best of his/her ability at all practises & matches.  To avoid causing or participating in any disruption.  To avoid any behaviour which may adversely hinder the enjoyment of other member’s time at the club.  To behave in a proper manner at all times when involved in club activities.  To be careful and tidy with club property and the property of other players.  To be respectful, co-operative and courteous to all within the club environment specifically but not confined to persons officiating at games.  Members are obliged to respect and care for all club property and grounds. They are obliged to play in the designated areas. (a) the cost of all labour and materials to restore the property or the cost in full of new replacement of the property. (b) a fine in addition to costs at (a) may be imposed. (c) the member may be suspended from the club pending the completion of all work and payment of fine, in addition to other sanctions.  Members are responsible for their own gear and personal property.  The Club will not accept any responsibility for any bags, gear, etc. 1. In so far as is possible, Stradbally G.A.A aim to provide a safe environment for all. 2. The club are fully aware that illegal drugs are a serious threat to young people today and prohibit the use of illegal substances on club property. Any violation of this will be strictly dealt with. 3. The club assumes the support of all parents/guardians in its continuing efforts to protect all young persons against the danger of illegal drugs. (b) Investigate the matter diligently. (c) Inform parents/ guardians of those involved. (d) Suspend members, if justified, pending a meeting of the Disciplinary Committee. (e) Parents/ guardians have a right to be heard by the Disciplinary Committee before any decision is taken by the Committee. (f) Where a member (or members) is (are) clearly identified with possession, purchase, sale or use of an illegal drug, the Disciplinary Committee may expel a member as constituting a risk to the members in the club. This is in addition to informing the appropriate statutory authorities. Stradbally G.A.A seeks to provide a caring and supportive environment for all its members, free from humiliation, oppression and bullying. This is a responsibility, which it takes seriously and is reflected, in its positive and preventative approach to the issue of bullying. The club strives to establish a climate in which the member who is being bullied feels that it is safe to tell. Members usually confide in coaches and/ or mentors because they know that action follows the telling. It is behaviour by an individual or group that is seen as an attempt to hurt, frighten, humiliate or threaten you or someone else, particularly if the behaviour is repeated or persistent. Physical – Hitting, kicking, pushing, horseplay, stealing, hiding, damaging or destroying someone’s belongings. Verbal / Written – Verbal threats, racist or sexist remarks, taunting, name-calling, malicious rumours, text messages or e-mails etc. Communications on group chat forums or on any other electronic media whatsoever pertaining to club activities are included. Extortion – Demanding money, personal property. Gesture - Different forms of non-verbal, threatening, insulting or provocative gestures, which intimidate a student. Emotional - Being deliberately unfriendly, excluding someone from a group or tormenting someone. Initially try to ignore bullies. Walk away and do not let them see that you are upset. Don’t give them the satisfaction of getting a reaction from you. Avoid being on your own. Try to stay with your friends. Tell someone you trust. This could be a coach, mentor, team captain, parent or friend.  The Committee is to be composed of the club chairman and two other nominated registered members.  Parents/guardians will be informed in writing prior to the appearance of any member before the Board of Discipline.  The Disciplinary Committee are briefed in writing as to the particulars of the case.  In the interests of natural justice it is important that the offending member be given an opportunity to present his case before the question of imposing a sanction arises. The member will be given a full hearing and will be questioned about the relevant matter by the Committee’s members.  When their investigations are completed, the Committee will make its recommendations.  Sanctions which may include suspension up to and including expulsion will be appropriate to the misdemeanour, and will be imposed in a fair and consistent manner.  Details of each case and subsequent sanctions, if any, will be recorded.  Members will show respect for coaches & mentors and for each other at all times and in all places whilst on club grounds or on club activities. 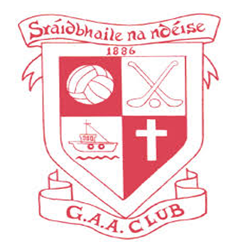 Any action which offends against courtesy, good taste, common sense or honesty or which brings discredit on the name of Stradbally G.A.A Club will be deemed to be a breach of club rules. Appropriate discipline measures will be decided by the Disciplinary Committee.  Offensive, aggressive and/or threatening behaviour towards any person, either on club grounds is a very serious breach of discipline. Appropriate discipline measures will be decided by the Disciplinary Committee.  Fighting will be deemed to be a very serious breach of the Code of Behaviour.  Bullying, either physical or psychological will be deemed a very serious breach of the Code of Behaviour. Each reported incident will investigated, parents/guardians will be informed. Very severe sanctions will be imposed where necessary.  Any member, whose persistent misbehaviour disrupts club activities and adversely affects the enjoyment of others, may be removed from the club event at the discretion of the Coach, Manager or Mentor and returned to the care of his parents if appropriate.  Smoking is forbidden on club grounds. If this is breached, severe sanctions will be imposed.  The club shall not be responsible for any injury, loss or damage suffered by the members while on or in motor vehicles either on or off club premises.  Possession of or involvement with alcohol other than on the licensed portion of the premises or carrying an offensive weapon e.g. a knife, is regarded with the same gravity as drugs, and will be dealt with accordingly.  Any form of harassment including sexual harassment, will be deemed a very serious breach of the Code of Behaviour.  Stop what you are doing and switch off any equipment you are using.  Listen to the instructions of the manager, coach or mentor.  Leave the building by the specified exit that is displayed in the room you are in and make your way quickly and quietly to the assembly point that is also displayed in the room.  Do not waste time collecting your possessions.  Line up quietly and wait for your coach, manager or mentor to take the roll.  Wait patiently and quietly until you receive further instruction.  No one should return to the building until the all clear is given. As every eventuality cannot be covered by specific mention in the Code of Behaviour, the Disciplinary Committee will interpret and decide in specific situations. The primary purpose of Stradbally G.A.A Club is the promotion & organisation of our national pastimes and sporting fitness as a means to develop discipline, self-reliance and enjoyment. We wish to take this opportunity to sincerely thank our members for their continuing voluntary support and assistance without which we would not be able further the aims of the Gaelic Athletic Association.